I tried this for the first time several months ago while on a coffee ice cream kick. 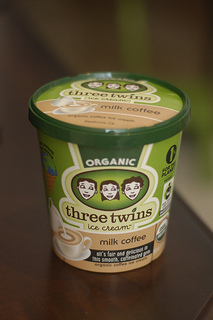 It’s my favorite of the healthy coffee ice creams, so I thought I would review it. I’ll report on my favorite less-healthy coffee ice cream later. The flavor is much what you would expect from the product name – sweetened milk and coffee. There isn’t any unexpected flavors or toppings mixed in. Compared to other coffee ice creams I’ve had, everything is a little toned down, and the dominant flavor and texture is that of milk, rather than coffee. It brings back memories of when I used to drink iced milk as a boy and the milk would crystallize around the cubes. This cream tastes significantly better when eaten in a half-melted state, bringing out extra flavor and texture. Carving out chunks of frozen cream with a spoon and popping in your mouth to chew just doesn’t give quite the same satisfaction as running your tongue across cold coffee-infused milk. Both the sugar and calorie count is a less than similar ice creams in the same class, with 200 calories and 17 grams sugar in a 85 gram serving. There’s 4 servings per container. As always, the ingredients speak for themselves, listed here in the order of highest concentration first: whole milk, cream, evaporated cane juice, nonfat milk, egg yolks, coffee, and vanilla extract. As you can see, three of the top four ingredients are diary related, which explains the dominant milk taste. This product is available at Whole Foods Market for $4.69, an excellent price considering the delicious taste and natural ingredients. Its also available at The Fresh Market and a few other places in South Florida. Nothing revolutionary here, simply a handful of natural ingredients put together with a great milk coffee taste and mild sweetness. Definitely recommended for coffee-flavored ice cream lovers. I was not able to find the nutritional and ingredient information listed online, but have sent an email to the company requesting this. Will update back when I get more information.